Version 14 of Parallels Remote Application Server introduced the ability to enforce and use specific versions of SSL, as well as allowing custom configuration of cipher strength. 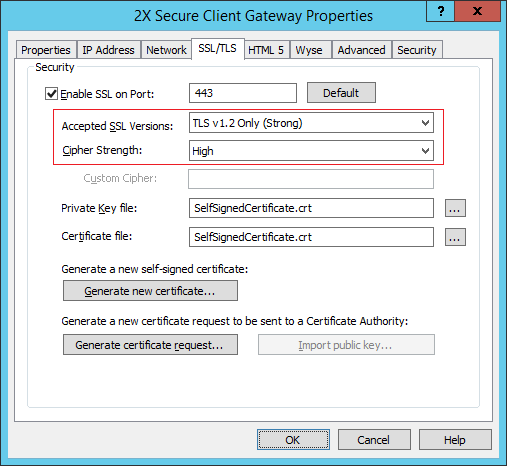 This article explains how to configure the cipher strength, when a Gateway SSL or Direct SSL connection from a Remote Application Server Client is established against a Secure Client Gateway. These options allow an administrator to choose the preferred version and protect against vulnerabilities discovered in older versions of SSL. In addition, it is possible to configure cipher strength. All the available options are based on OpenSSL standards, documented here. Low: low encryption cipher suites, currently those that use 64 or 56-bit encryption algorithms but exclude export cipher suites. Medium: medium encryption cipher suites, currently some of those that use 128-bit encryption. High: high encryption cipher suites, currently those with key lengths larger than 128 bits, and some cipher suites with 128-bit keys. A cipher string can be constructed by linking different cipher parameters from the list available here. As of version 14.1, the pre-defined ciphers will also be visible in the Secure Client Gateway Properties. Detailed information about Cipher Suites is available in this article.